Relive the magic as Harry, Ron, and Hermione travel to Hogwarts for the first time in Harry Potter and the Sorcerer's Stone. Featuring images of Harry, Ron, Hermione, and a film cell from the first film, this Harry Potter and the Sorcerer's Stone Series 8 Mini Cell measures approximately 7-inches wide x 5-inches tall. 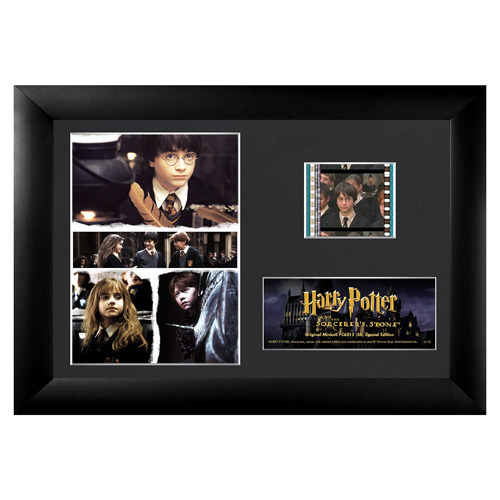 This film cell includes an easel back for easy display and a Trend Setters embossed/foiled certificate of authenticity. Each FilmCell presentation is made with careful attention to detail. It's double matted, placed in a quality frame, and contains a clear front and back allowing natural light to enhance the film frames. Each piece of film is hand cut from reels to provide you with the best possible scenes to offer a unique and varied product. All this is combined to bring you a collectible that looks great in any room. Ages 15 and up.